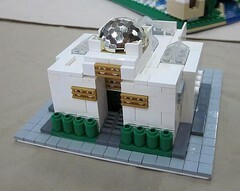 The Brickenburg Association is going to set up an AFOL event in Cluj-Napoca, Transylvania, Romania, between the 15th and 20th of May 2012. We would mostly welcome your LUG members’ participation to it. If anyone of you is interested in joining in, he/she can write us on the following e-mail address brickenburg@yahoo.com till the 01.04.2012 and we will be coming back with all the details including the accommodation. Oh verflixt, da wollte ich ja auch was schreiben! Regarding our event in May, we can cover for you the accommodation (bed and food for 4 persons ) and if you come by car, LEGO Office Romania agrees to support your travel expenses ( fuel ) on Romanian territory. We need the answer until the 1'st of April. Wobei ich jetzt nicht weiß, ob dieses Angebot nur für mich gelten würde, oder allgemein ... müßte man sich bei Interesse erkundigen! Und obwohl es sicher reizvoll wäre, mal in diese Ecke der Welt zu reisen, aber diesmal nicht!